This year to celebrate Lunar New Year (The Year of the Pig), Flushing Hospital Medical Center’s Food and Nutrition Department handed out Mandarin oranges with a Happy New Year card to patients, visitors and staff. This gesture is in keeping with FHMC’S commitment to cultural sensitivity. The Chinese word for mandarin is kam, which sounds similar to the word for gold. Therefore, having mandarin oranges with you around New Year is thought to bring fortune into your life. The patients, staff and visitors were all appreciative. 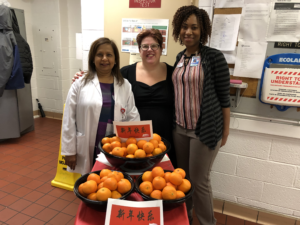 This entry was posted in Health and tagged #LunarNewYear #YearofthePig by Joann Ariola. Bookmark the permalink.